Radio Yorkshire has today launched a new daytime line-up. The DAB and online station, which has recently begun broadcasting in Leeds again, has given current daytime presenter Andy Lawson a new afternoon show in a fresh time slot of 2-6pm. 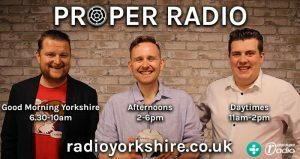 Sport @ 6 presenter Danny Parkinson moves to Daytimes, 11am - 2pm while Good Morning Yorkshire, hosted by Darren Harper, remains in its 6:30am-10am slot. Lawson said: "I'm utterly thrilled to be taking over the Afternoon Show on Radio Yorkshire! Most of my career has been spent on air at this time of day, and the idea of bringing a creative mix of fun to the airwaves in the afternoon really thrills me. Oh, and un-setting the early alarm on my phone is also going to feel great." The new line-up follows the addition of broadcaster Martin Kelner to the Saturday line-up. Kelner, who was sacked by BBC Radio Leeds in March, hosts Pre Match Tension between 10am and 1:30pm. Director of broadcasting Sam Brydges said: "The reaction to Martin's show has been fantastic as we knew it would be. Andy Lawson moves into the slot he considers home and we can't wait to hear the new sound of afternoons. Listeners will enjoy Danny, he's great fun on air and is a passionate Yorkshireman."